In 1911, the American pathologist Peyton Rous had recently graduated from medical school, and with only four years of research experience, had been placed in charge of cancer research at the Rockefeller Institute. For the next twenty years, the results of his studies were sometimes ignored and often derided by the scientific community. Only fifty-five years later—four years before his death—were they fully acknowledged, when he received his Nobel Prize in 1966; this may represent a record for the time elapsed between a discovery and the award. We now know that some 15 to 20 percent of all cancers are caused by viruses, most of which occur in animals. Among Rous’s first projects at Rockefeller involved determining the cause of a sarcoma, a large tumor growing on the breast of a Plymouth Rock hen. Recent literature accounts of unusual transmissible growths in animals aroused his interest. He successfully produced tumors in similar healthy hens (but not other birds) after transplanting small samples of the tumor—the first demonstration that a cancer could be transmitted from one bird to another. Later studies revealed that it was unnecessary to transfer intact cells, as they could be produced by injecting a cell-free, bacteria-free filtrate obtained from the tumor. Rous concluded that tumors in hens were caused by a filterable agent. For decades after the discovery of the first virus—the tobacco mosaic virus in 1892—viruses were referred to as filterable agents. Later, the designation virus was restricted to filterable agents that could only grow on living cells. Rous had discovered the Rous sarcoma virus (RSV), a retrovirus, and the first oncogenic (tumor-causing) virus to be described. A retrovirus contains RNA instead of DNA, and transcribes information to DNA once inside its host. An oncogen is a cancer-causing gene that is found in retroviruses. In 1976, J. Michael Bishop and Harold Varmus found that normal oncogenic genes in healthy cells could cause cancer if they were picked up by retroviruses—work for which they were awarded the 1989 Nobel Prize. SEE ALSO: Viruses (1898), Cancer-Causing Genes (1976), HIV and AIDS (1983). 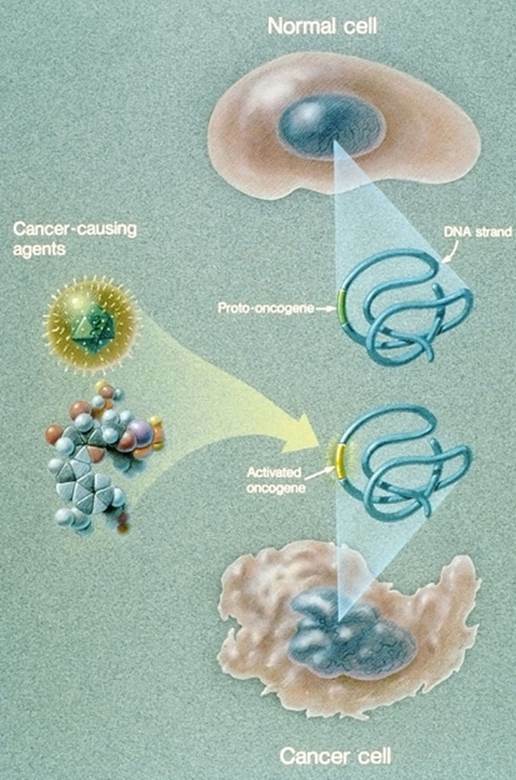 This illustration from 1989 shows how a normal cell becomes a cancer cell after a cancer-causing agent, such as a retrovirus, activates an oncogene on the cell’s DNA.